O is for Older..and WIAW! We have come to the letter O today in the Blogging A to Z Challenge. As happens with all of the Wednesdays in the month of April, it also coincides with What I Ate Wednesday hosted by Jenn at Peas and Crayons. But let’s talk O first and then we’ll get to the food. Monday we celebrated Ralph’s birthday. I won’t reveal which birthday milestone it was for him, that would be for him to share, but it is an important one. Each of his birthdays is important to me because I love him. We found each other later in life and I want to spend as many birthdays with him as possible. Ralph often talks about the fact that he doesn’t like getting older. I think most of us spend a good chunk of our lives not worrying about getting older and then it hits us and we spend another good chunk of our lives worrying about getting older. At one point in my life I worried. Probably at a younger age than many people. As time goes on I worry less and less. I think the worrying has subsided because I’m feeling so good. I’m in good health thanks to the many changes I’ve made in my routines over the years and I think I’ve got a handle on most things involved in the aging process. I’m not young anymore, but I only feel that sometimes. On the rainy days when everything hurts, I get annoyed that I’m getting older. But then if I can get up and moving, things hurt less and I think less about my age. I know that I’m so lucky in many ways and truthfully, one of the ways in which I’m lucky is that I get up every day with the opportunity to grow older. I want to keep working on that plan. And now to the Food!! Food this week was all over the place again. 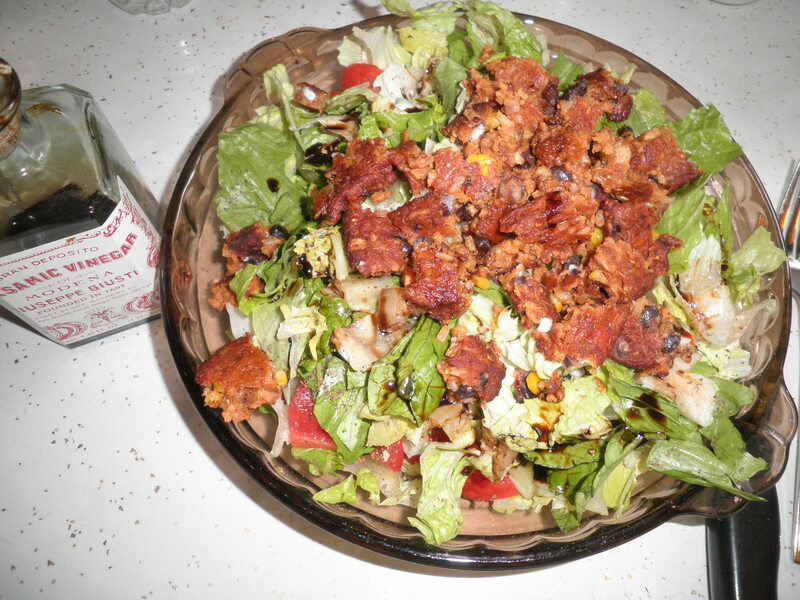 A homemade salad with spicy black bean burgers on top and balsamic vinegar. 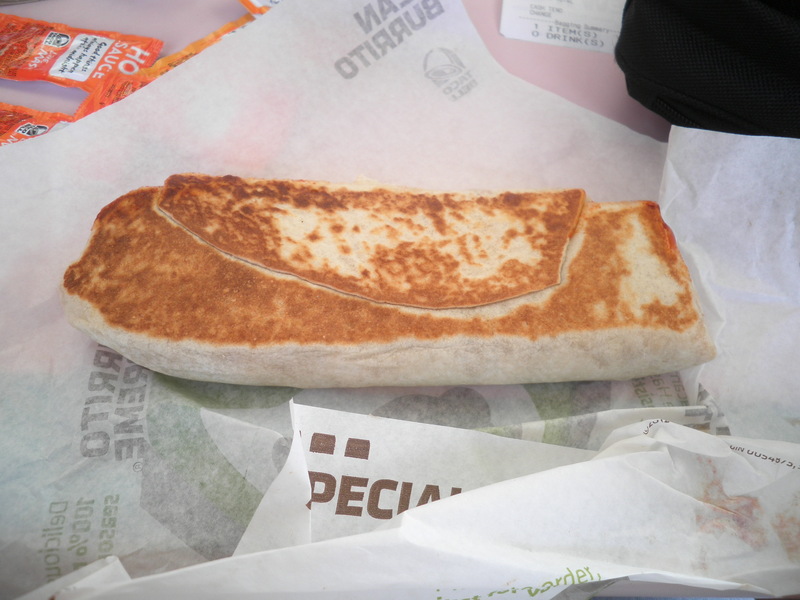 A grilled bean burrito at Taco Bell. Grilling it doesn’t add any Points to it and give it a bit of a different flavor. Yummy. 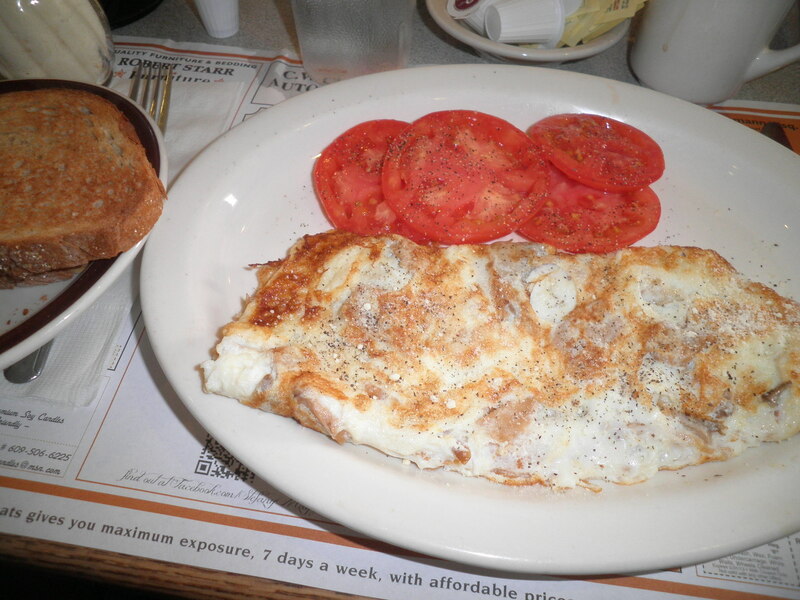 An egg white omelette with mushrooms topped with grated cheese and sliced tomatoes on the side. Always a winner. Now on to the Birthday celebration! 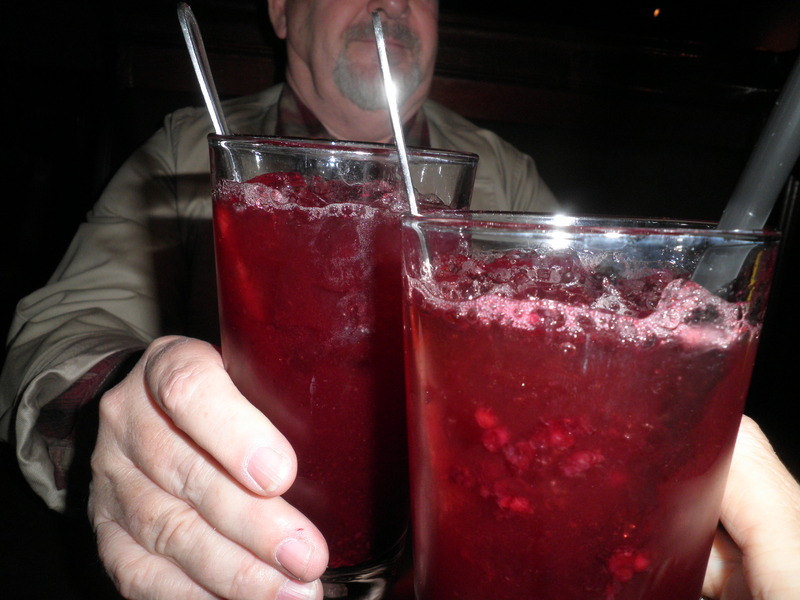 Blackberry tea at Ruby Tuesday’s. Our favorite! Cheers! Ok, I know I shouldn’t have but I did. I ate one of the little cheese-y biscuits that they have there. The Birthday Boy saved me and ate the rest. For me as usual, it’s the Garden Bar. I was a little disappointed with it this time. First of all, the plates are Much smaller than they used to be. I like a big salad plate so that I have room to move things around. I know I can go back as often as I want, but I like to arrange my salad to my satisfaction and that’s not always easy on a smaller plate. The second issue is that the selection is not as good as it used to be. That was sad to me. I could always count on their salad bar to give me lots of choices. It’s still much better than some other salad bars, but I was disappointed. Ok, transgression number two. We did get dessert. 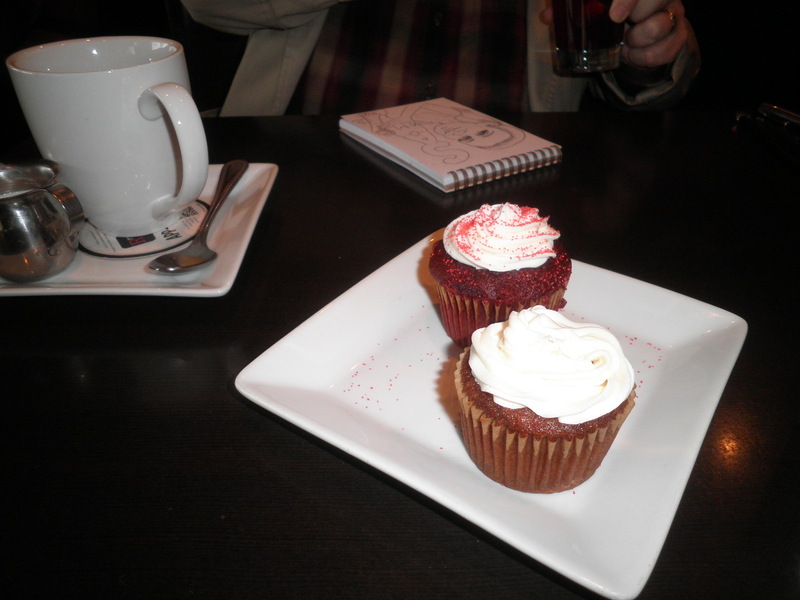 Ralph had a red velvet cupcake and I had a carrot cake cupcake. I have to say that mine was just delicious and truly worth the Points. My only saving grace is that this was on Monday and I have until Saturday’s weigh in to work all of this stuff off. It was a special day and it was a wonderful celebration. After lunch we took a walk through the Mall where the restaurant is. I forced Ralph to try something on for me. I think he looks adorable. With or without the hat. He says that as he gets older, women seem to be more attracted to him. He calls it the Sean Connery Effect. Maybe he’s right, but I think he’s pretty cute on his own! Be sure to check out some of the other blogs both at Blogging A to Z and At What I Ate Wednesday. You’ll find some new favorites and be sure to leave some comments. Happy Birthday, Ralph! Happy WIAW!! This entry was posted in Uncategorized and tagged Blogging A to Z, Weight Watchers, WIAW. Bookmark the permalink. love seeing the photos and hearing about ralph’s bday celebrations. 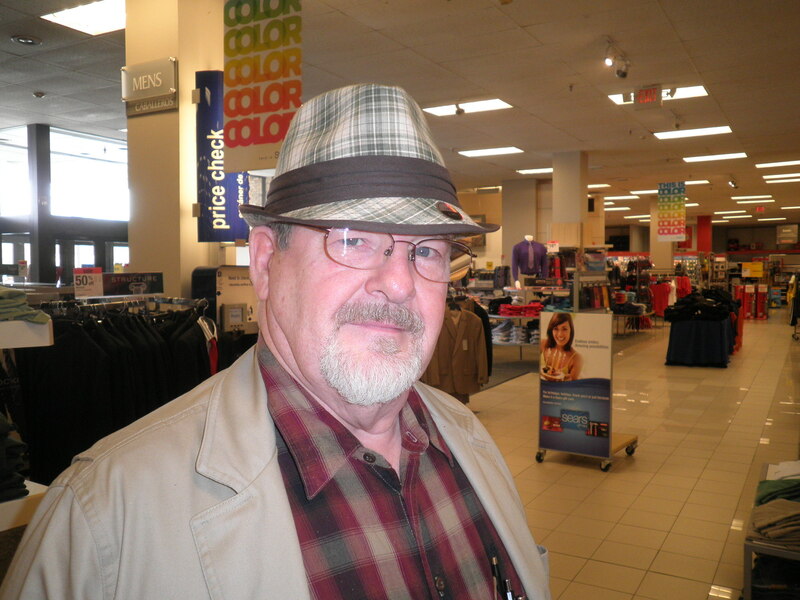 he looks pretty dapper in that hat! sorry the salad bar was not as great as some times…i would go for that choice, too! getting older…i am feeling it since my bday in january. it never really has hit me before! but you are only as old as you think you are and most days i can convince myself to knock off a couple decades! off to TO for my usual aunti wednesday! Cathy, it always makes me happy when you say you’re off to TO for Aunti Wednesday! I love it. I think the age thing does hit me right around whichever birthday it happens to be. I think that’s why I like to celebrate for the entire month to push those “old” thoughts away. In truth, I feel much younger than I am and I hope to continue that way. Have a wonderful day with the girls! 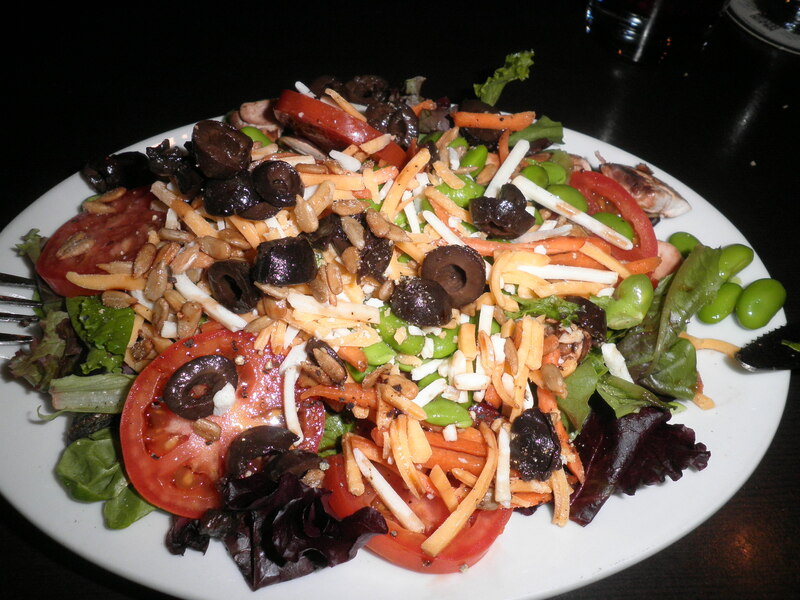 Yummm a salad with a black bean burger sounds good! Liz, it is so tasty and very filling. Had it for dinner last night again. I was starving and thought I would need something else after. All I had was an orange and I was set for the night! Blackberry tea…YUM! I also love the dark croutons on the RT salad bar. They are crunchy on the outside and soft on the inside. I know they aren’t good for me, but I only eat a few and they are delicious! I didn’t know RT had cupcakes. Is that new? Hi Sonja, thanks for visiting! Glad you liked what I said about Ralph…he really is that great a guy! I think the cupcakes might be relatively new. What I like is that you get to have something tasty and sweet, but it’s not huge. It was very good and the best part is that they’re only 99 cents!! Please stop back again! Wow, that is a deal! And I agree, just a little sweet treat at the end of a meal does the trick for me. All of your meals look delish! 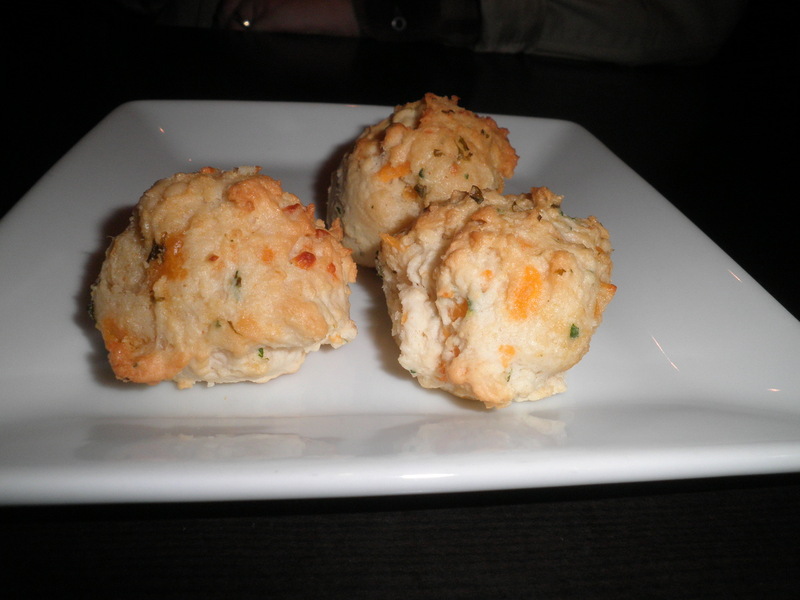 I love those cheesy biscuits too…they are hard to resist! Kim it was terrible…the server plunked down 4 in front of us. I ate mine then thought I should do the photo. I’m proud of myself for stopping there! Jennifer, it’s one of my favorites. The whole thing is so filling but low in points for me on WW. I stock up on the veggie burgers mostly to eat them that way rather than as a burger. So good. First of all, Fran, about this “older” nonsense. You are young until you’re 80. Thereafter, you are venerable. You may become “more mature” as you slide towards 80, but you are never “old.” Remember that; it’s important! Your meals. Ralph’s birthday (maybe 50) meal. Sigh. Oh to be able to cook like that. I like your way of looking at age, Rob. Very practical. Are you guessing that Ralph is 50? He would bless you and give you a big bear hug in return! As you can see, we eat out a lot, but I’m I decent cook when I put my mind to it. Have a great day! I haven’t been to Ruby Tuesday’s in awhile, but their flavored teas were the best part in my opinion. Blackberry sounds great. It’s delicious, Madison! It’s Ralph’s and my favorite. We like going there.